Hello, Diana here to share a couple of cards with you. After Terre's gorgeous black and white card last week, I've been inspired to create some of my own. My first card is an in-laid/shaker card. 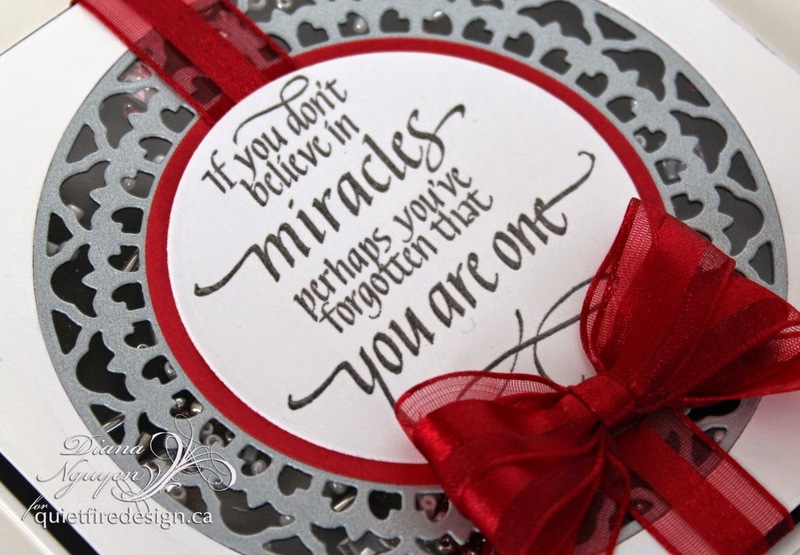 I used Spellbinder's Marvelous Circles and Standard Cicles to frame my sentiment from the If You Don't Believe in Miracles set. I stamped it in black pigment ink and then clear embossed. For the shaker element, I die-cut the largest Marvelous Circle die out of both silver and white card stock. I then adhered the open white with the silver inlaid inside on clear acetate. To pop up the top layer, I used fun foam around the circle and also the inside circle. It would a waste of a lot of beads not to cover up the center of foam since it wouldn't show! Finally I added a double red bow for a bigger splash of red. I stamped the letters and embossed them. Then I just doodled with my black ultra fine Sharpie marker different patterns. Hope you get to play with your crafty stuff too! Hello all! I am back again to share a couple more projects with you today using Quietfire designs. I have loved creating with these stamps throughout the month and will be continuing to do so right thru Valentine's day, coming up in just a couple of weeks!! And for that matter.... i don't think I'll be stopping just because Valentine's day is past! These are fabulous to use all thru the year!! So, let's get on with it shall we? 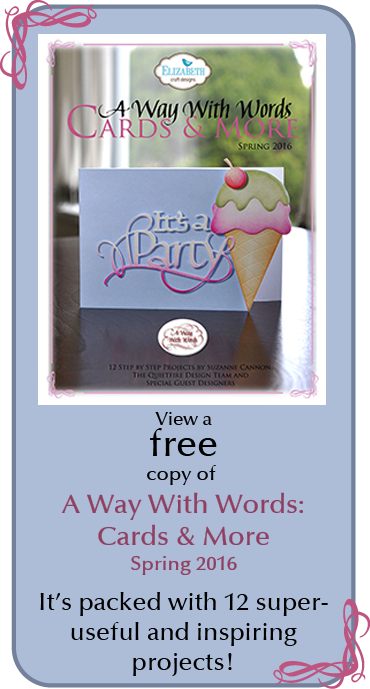 Today I will be sharing with you a card as well as a candle!! 1. 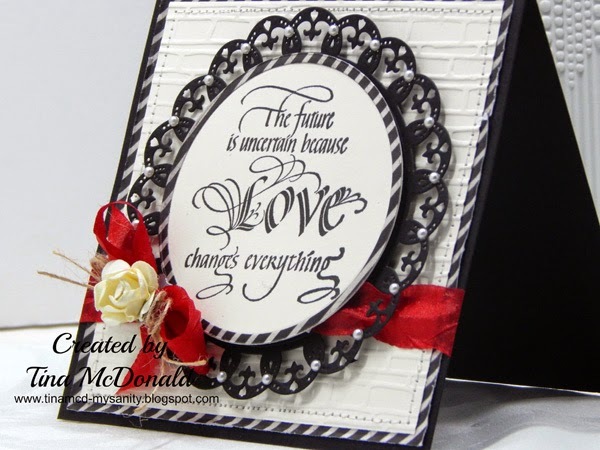 Create card base from black card stock 5" square. Trim striped paper slightly smaller. Distress edges and adhere to card front. 2. Trim cream card stock slightly smaller. Emboss using Spellbinders embossing folder and embossing machine (see supplies below). Adhere to card front. Machine stitch around edges. 3. Diecut black Royal circle die #3 (with #1 being the smallest). 4. Stamp sentiment onto cream card stock. Diecut using Standard Circles Lg.Nest together 2 circle dies and die cut striped paper to create a ring. Adhere to die cut sentiment. 5. Adhere black Royal Circle to card front using foam tape. Thread red ribbon thru and adhere to back of card front. 6. Adhere sentiment circle using foam tape. Tie ribbon into a bow and adhere, along with twine and flower. Quietfire Designs: "The Future Is Uncertain"
For my second project, I have added a gorgeous Quietfire Design stamp to a candle!!! I have created a video tutorial to show you just how I did this! It may look complicated but it is EASY to do!! Just watch!! 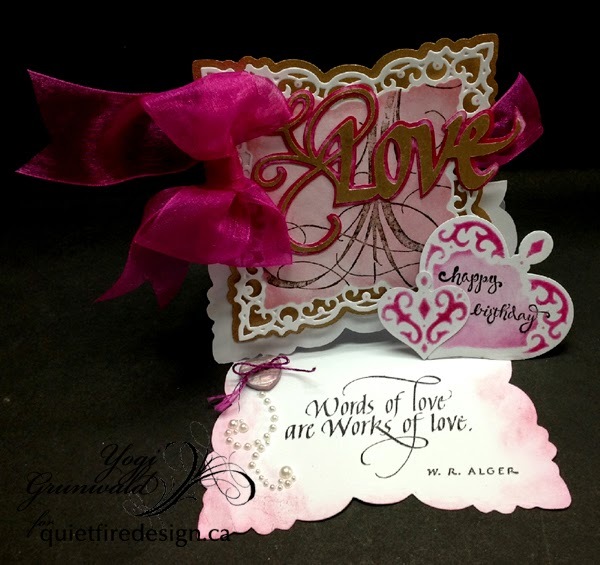 Quietfire Designs: "The Heart Has its Reasons"
And here is the video showing you just how to do this yourself!! I'd love for you to follow along on my creative journey! Visit my blog here and subscribe to my Youtube channel here!! A HUGE thank you to Quietfire Design for the honour of being their Guest Designer this month! I have LOVED creating these projects to share with you! Be sure to stop by my blog for more inspiration in the coming weeks using Quietfire Design!! 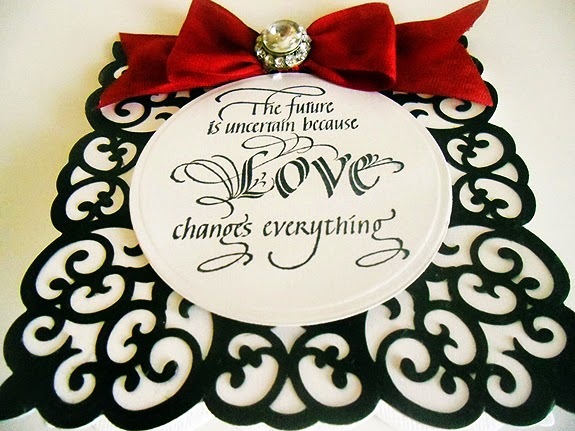 The sentiment was stamped onto ivory card stock and die cut using Spellbinders Gold Circles One. A white doily was placed under the sentiment. 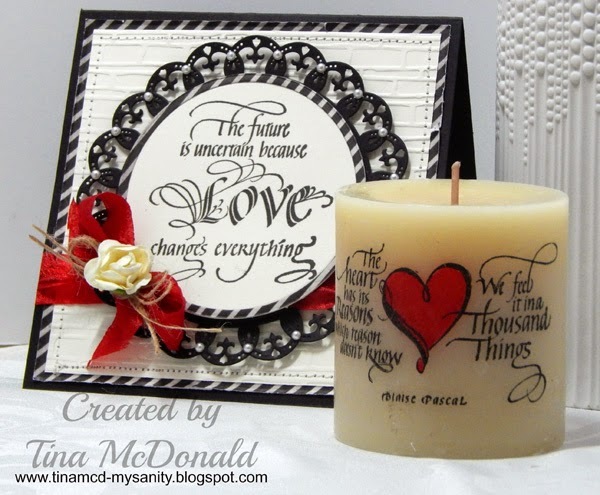 I considered distressing the doily with ink but the white doily helped to emphasize the ivory die cut and sentiment. 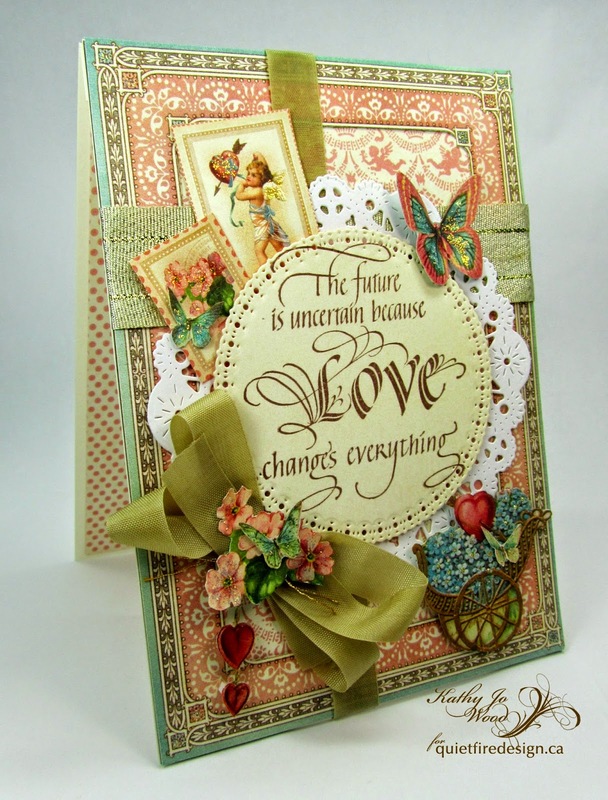 The patterned paper is from Graphic 45- Sweet Sentiments. I chose the paper for a few reasons: the name matches the description of the sentiment, it is beautiful paper, and because at CHA Suzanne Cannon and I took the Graphic 45 class together. It was the first time Suzanne and I met and I really enjoyed the class with her! I thought it would be great to have my first design post after CHA to include Graphic 45 paper. 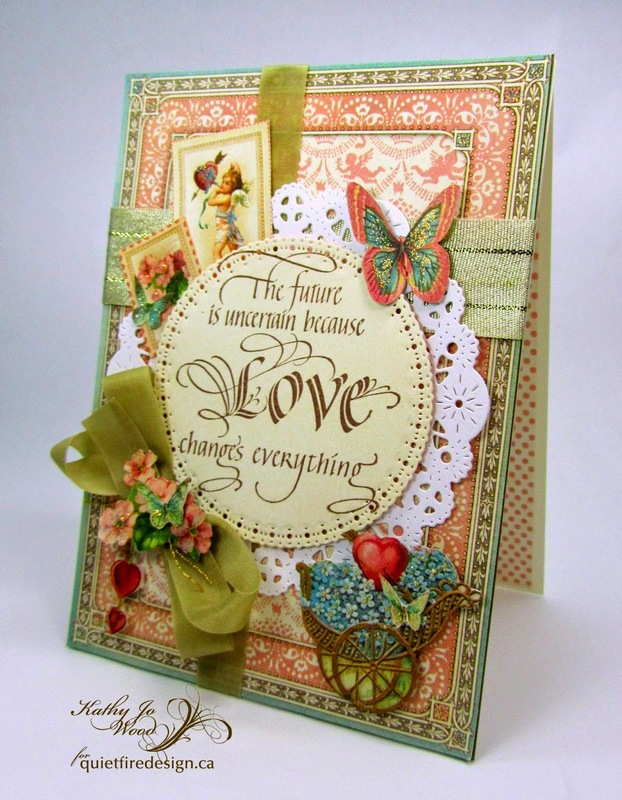 Suzanne's gorgeous stamps and Graphic 45 paper go so well together! I love how she designed the "Love"! Beautiful! There was a little bit of fussy cutting involved but was worth it. The hearts had to be cut out to go with the stamped sentiment! Glossy accents was applied to the heart strand. Stickles was applied to all of the butterflies and flowers. Thanks so much for stopping by! I do hope you enjoyed seeing the stamped sentiment and the project! PS: Do you want to buy the stamp and die used on this card? Good news: the newly released stamps are 20% off and the Spellbinders dies are 40% off! Our Queen of Heart Blog Hop Winners! You're all winners to us because we love that you come and visit our projects and leave nice comments! Gorgeous cards, all of them! How you come up with these while being jet-lagged, I am so amazed! 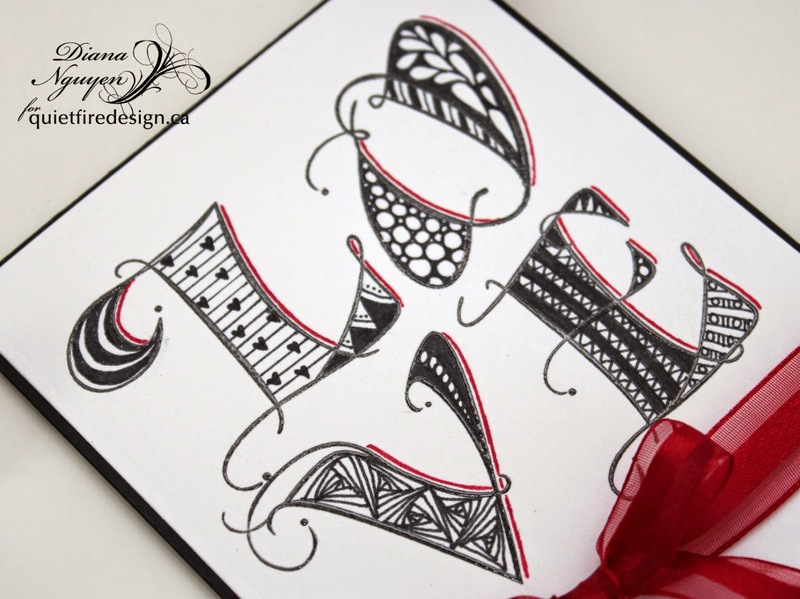 :-) I love the hand drawn elements, which make the card extra special. Thanks for sharing! Thanks again to everyone who commented. And thanks to the best design team in the whole world for making such amazing projects! 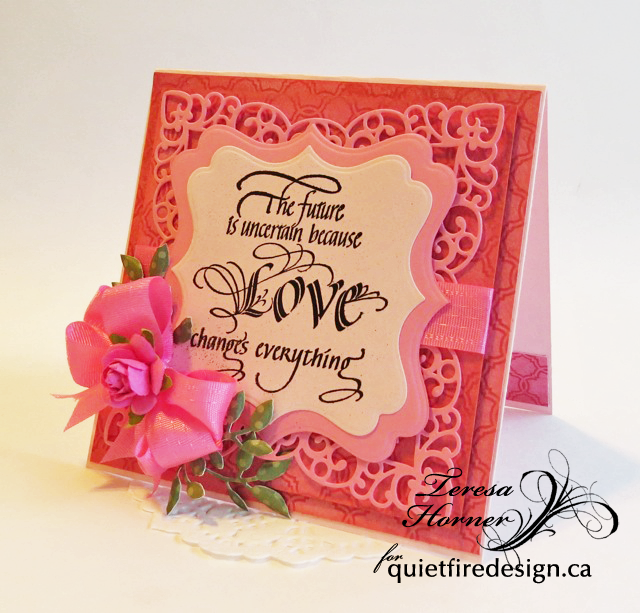 Terre here with a Valentine's Day card using Quietfire Design's The Future is Uncertain Stamp. and the Standard Circles Large. I added a pretty red bow at the top using May Arts Ribbon, the rhinestone embellishment was purchased from Hobby Lobby. We're trying something new and fun for us! 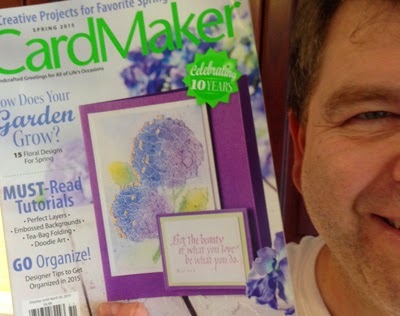 We're still celebrating having a Quietfire created card on the cover of CardMaker Magazine. (It's a really big deal!) It's on news stands now! We're going to give away a package of stamps valued at approximately $25 to someone who takes a selfie of themselves in front of a news stand holding (or beside) a copy of "our" CardMaker magazine! You must post your selfie on our Quietfire Design Facebook page before February 1, 2015 and you'll automatically be eligible! This doesn't have to be great photography, but we want to see at least *part* of you (even an ear or eyeball!) and the magazine. 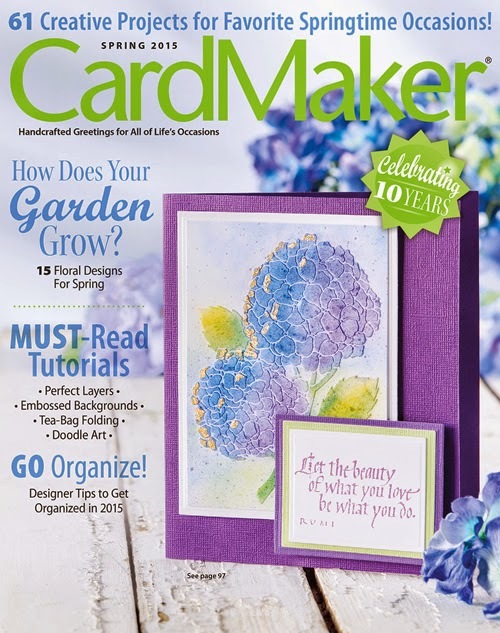 Of course if you purchase the magazine, CardMaker will love you! We're looking forward to "seeing" you! Good luck! Suzanne's Blog (that'll be mine). Only one job left for you to do! Visit and leave a comment. Make sure you leave comments (not here!) on all the blogs! You can go back to any of the blogs you may have missed if you joined us late. You have until Sunday midnight Pacific time to leave a comment to be eligible for a rubber stamp prize. We'll list the winners shortly after that. Here is the list of blogs with their links one more time! Thanks so much for joining us. We hope we've inspired you to head to your craft space and ink some stamps and cut some paper! A big round of applause for the Design Team! They are absolutely awesome! and Good Luck to you in the draws! Welcome to the Quietfire Queen of Hearts 2015 Blog Hop. It's Day um, losing track... 4! Make sure you leave comments (not here!) to be eligible to win a prize! Tell your friends! Welcome to the Quietfire Queen of Hearts 2015 Blog Hop. It's Day 3. Welcome to the Quietfire Queen of Hearts 2015 Blog Hop. It's Day 2. Make sure you leave comments (not here!) to be eligible to win a prize! Welcome to the first day of the Quietfire Queen of Hearts 2015 Blog Hop. We're so happy you're joining us! 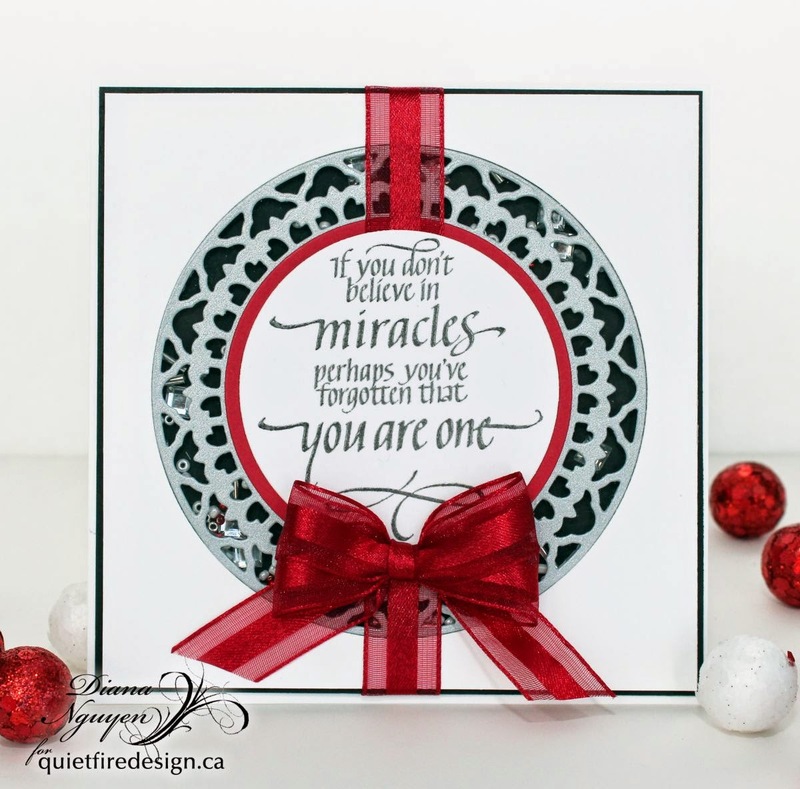 Welcome to the Quietfire Design 2015 Queen of Hearts Blog Hop! Here we go for the annual Queen of Hearts Blog Hop! We're having it much earlier than usual so you have time to get your Quietfire stamps and start creating! Of course we have prizes! 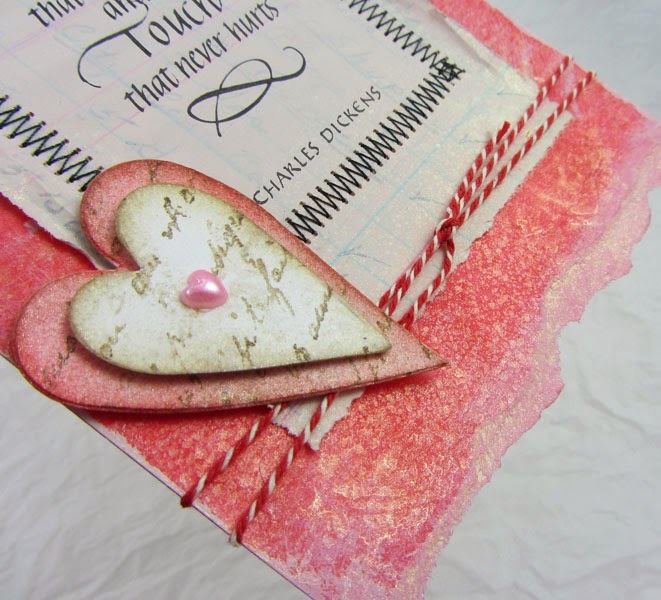 Leave a comment on each of the Queen of Hearts Blog Hop blog posts and you will be eligible for a rubber stamp prize from that blog. For a chance to win a Quietfire rubber stamp (don’t be shy!) leave a comment on the blogs before midnight Sunday January 25th, 2015. A winner will be randomly chosen from the comments and the winner's name will be posted on Quietfire Creations shortly afterwards. Hello!!! 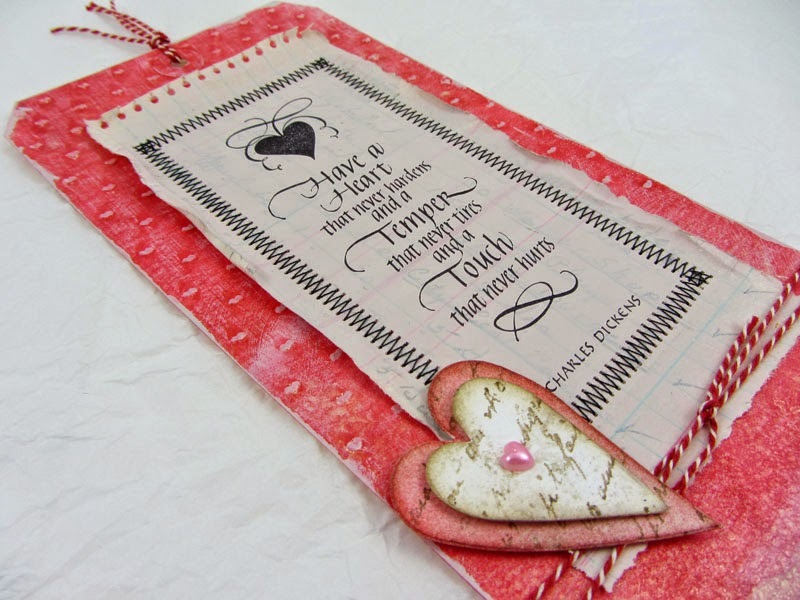 Wanda here today to share a tag using the new Have a Heart that never hardens cling mounted stamp. The quote is stamped (Archival Ink jet black) on a torn and painted (Fresco Finish vintage lace) piece of ledger paper from an old spiral ledger book I found at an antique shop. The base tag is a Ranger #10 manila tag painted (Fresco Finish cherry red), embossed (old Cuttlebug folder of little hearts), dry brushed (vintage lace), torn and painted along the bottom with extra paint around the edges. I used glue stick, just in the center, to stick the quote to the tag and then sewed it to the tag. I crumpled the edges of the quote panel a bit, tied on the string, and added some heart cut outs and a heart sticky back pearl. Finally I covered the center with a baby wipe and sprayed some Perfect Pearls Mist biscotti around the edges. Most of us haven't recovered from CHA yet, but that won't stop us from inspiring you next week! Stay tuned for more information about the prizes and hop by subscribing to our newsletter! stamps that were just released. This one is called "The future is Uncertain"
and a matching flower to finish it. for the month so be sure and check back for more fun ideas. 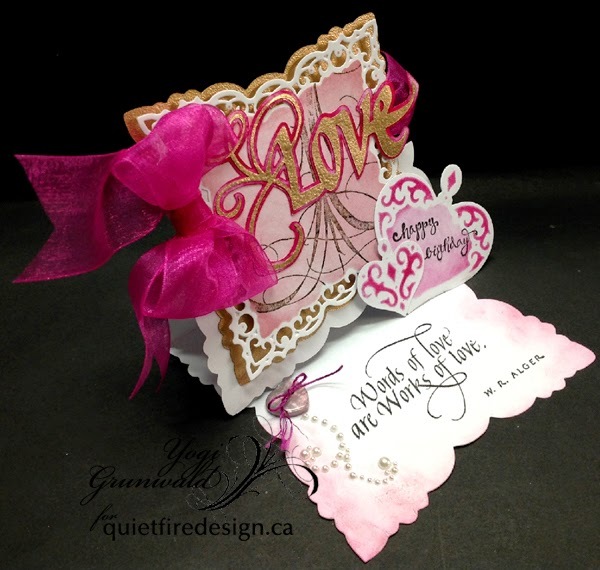 Yvonne here with using a brandnew Quietfire Design stamp. It's only anout a month from now before it's Valentine's Day, so...to get in the mood I created you a Valentine's card. Only...not in the usual color red, but in soft pastel colors. I hope you will like it too! make a white base-card size 5⅝"x7"
Cut some blue patterned paper to size 5¼"x6⅝" and use a distress tool to alter the edges. Then rub a Distress inkpad along the edges. Glue upon the layer upon the card base. Cut white cardstock to size 4¾"x6⅛" size and alter the edges. Glue upon cardbase using 3D foam squares. 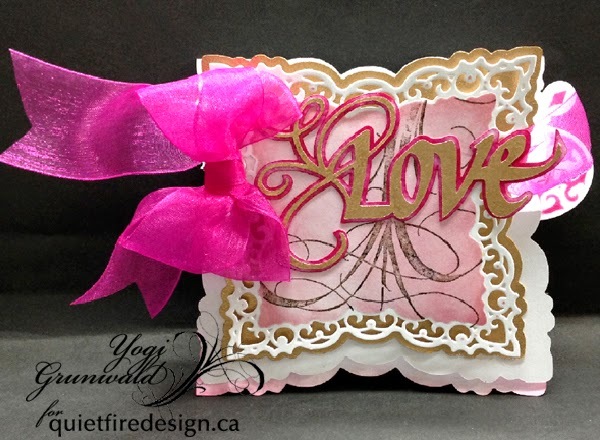 Cut pink patterned paper to size 4¼"x5⅝" and glue upon cardbase using 3D foam squares. Stamp the Quietfire Sentiment upon white cardstock using black ink. 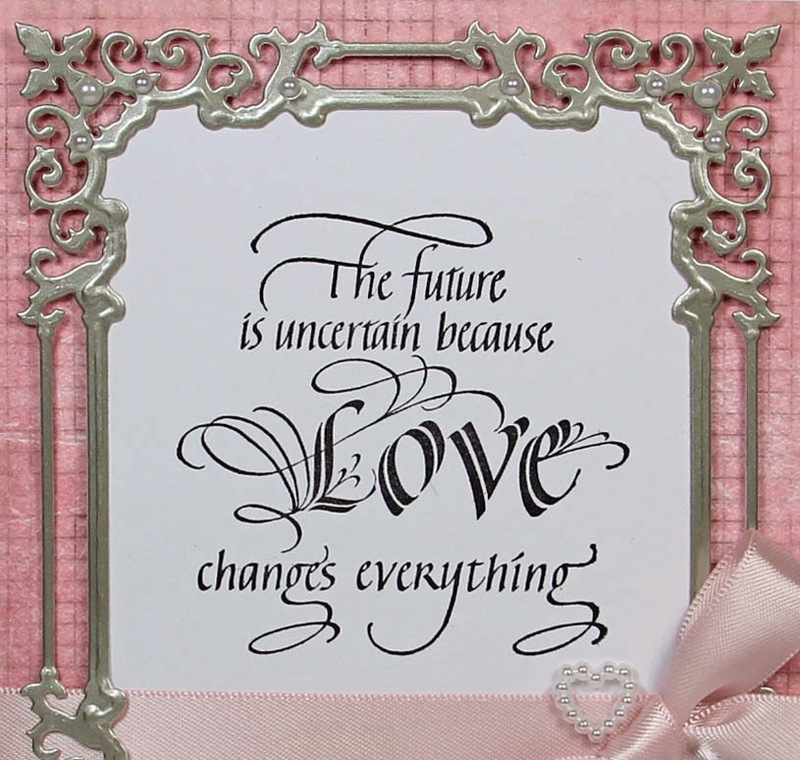 Then die-cut the sentiment using Spellbinders Regal Frame (the largest die only). Glue upon card card base using 3D foam squares. Attach pink satin ribbon horizontally to the card. Cut/emboss the largest two dies of the set Regal Frame from silver cardstock. Glue onto the card. Embellish using self-adhesive Pearls, a bow and a pearl heart. I hope you like my card and I'm looking forward (as always) to your comment! Yogi here today with a Valentine's Birthday card... It's that time of year for me where there are lots of birthdays scrunched within the next couple months. I die cut the largest of the Spellbinders "Labels 42 Decorative Accents" frame from white cardstock, sponged through the die using a dirty pink sponge. Stamped the largest FLOURISH using Versafine Black Onyx and clear embossed. Used the negative of the die cut to scan and then cut a shadow layer using my electronic cutter. Hit the edges with Versafine "Toffee" and embossed with Queen's Gold embossing powder. Adhered both layers together with 3D foam tape. Used the same scanned image to create my easel card, welding 2 frames together, selecting all, and increasing the size to 10" high so I would end up with a 5"h card when folded. Scored and folded the easel and adhered the decorative layer. eCut the word "Love with a Flourish" as well as a shadow layer from white cardstock, inked the first layer with the Toffee and embossed with the gold. Hit the shadow layer with Distress "Picked Raspberry", then with Versamark, then adhering the first layer to the shadow layer as quickly as possible so the shadow layer was still wet enough to clear emboss. Adhered to card front. Tied a double peg bow from 1.5"w Fuchsia gauze ribbon. adhered to card with a glue gun. Used a small left over piece to adhere under the "e" on the right side. Die cut the 2 smaller hearts (Spellbinders "Nested Hearts") from white cardstock, sponged edges with Picked Raspberry and clear embossed. adhered one to the other and then added a small flap on the back to create my stopper for the easel. Cut the Happy Birthday - plain & simple sentiment in half and stamped using the black. 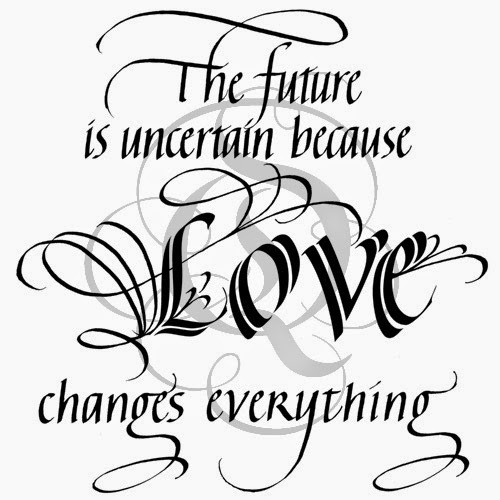 Stamped the "Words of Love..." quote using the black and clear embossed. Added a mauve heart button tied with some fuchsia string and adhered using the glue gun. Added some white pearl flourishes. Click on any image to enlarge. Enjoy. Hello!! 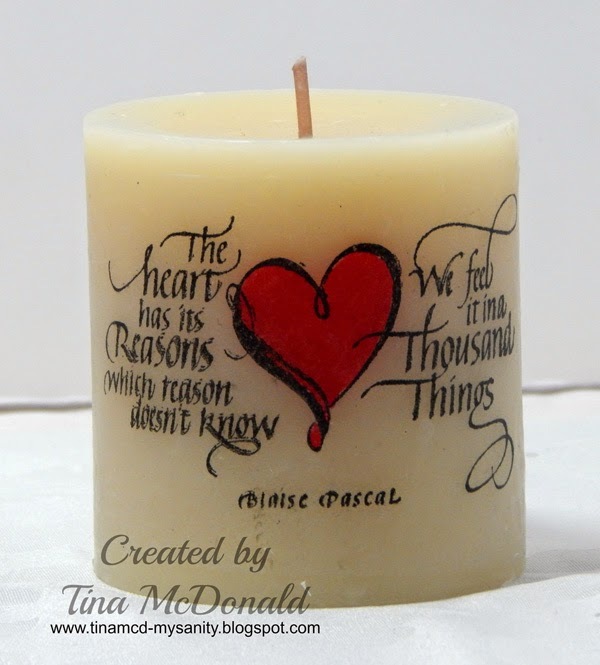 I'm Tina McDonald and I'm So thrilled to be here as a guest designer for Quietfire Design!! 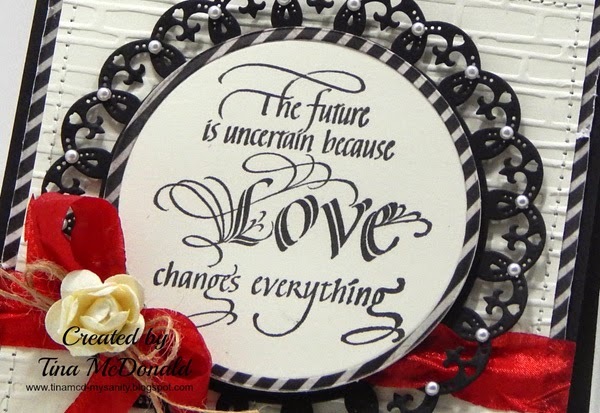 Today I have 3 cards to share with you using the Calligraphic Love Bits, Item #5699. My plan was to create "a" card... but when I got going, I just couldn't stop at one!! I'm STILL coming up with ideas and creating more cards with this set, so feel free to stop by my blog once in a while to see the other creations I'll be sharing throughout the month. 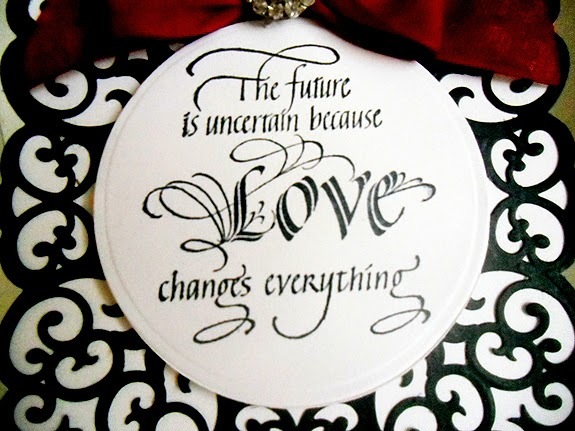 And with Valentines Day just around the corner, my projects will have a LOVE theme to them!! For my first creation, i went with clean and simple. I ADORE how elegant these stamps are, I didn't want my design to take away from that. So I kept it simple. 1. Trim and score black card stock to create card base. Trim white card stock slightly smaller. Adhere. Stamp sentiment using Black ink onto bottom right corner. 2. Trim silver embossed paper and adhere to top 2/3 of the card front. Trim thin strip of black card stock and adhere along bottom of silver paper. 3. Add red mirrored heart stickers. For my second design, I went a bit more layered and colourful!! A bit more trendy in style. 1. 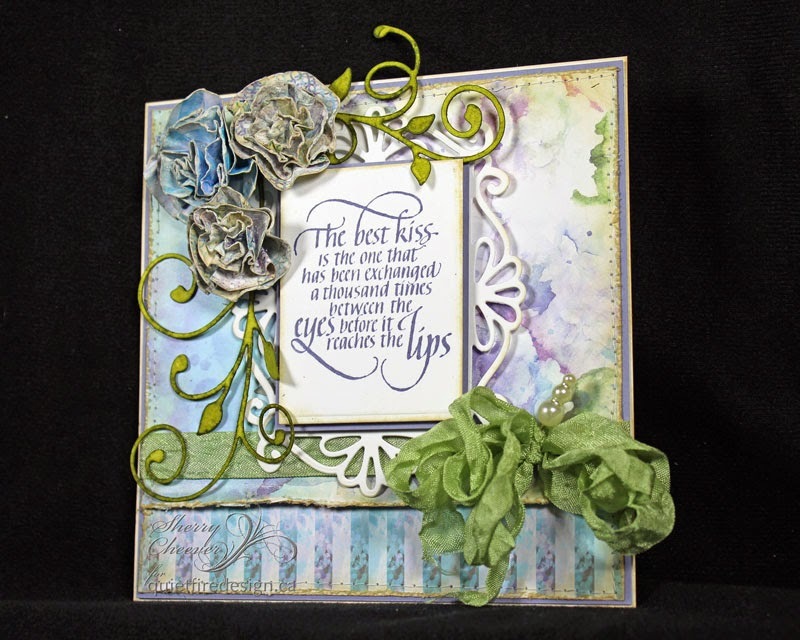 Create top fold card base. Trim black card stock slightly smaller. Adhere. Trim newsprint paper slightly smaller and adhere. Use sewing mating to stitch the edges. 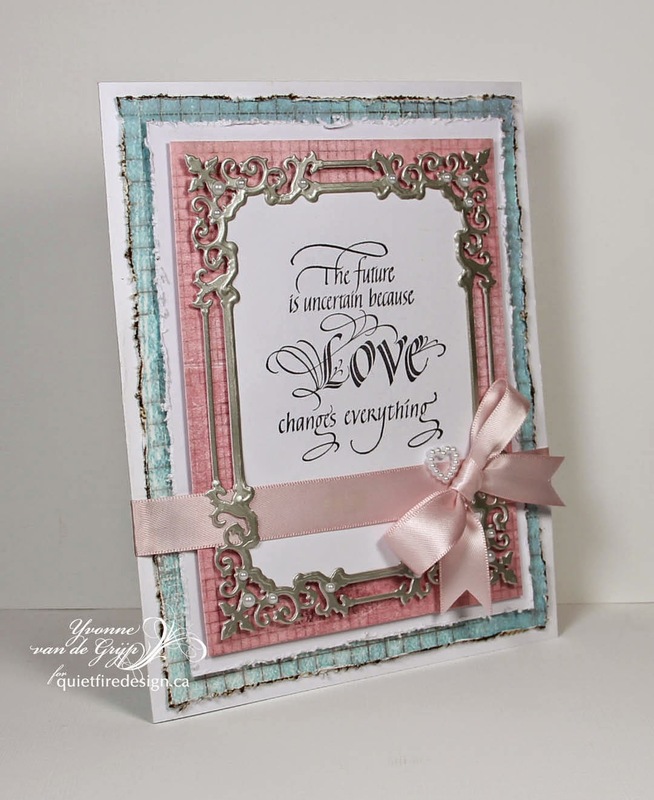 Sprinkle irRESISTible texture spray across card front and allow to dry. 2. 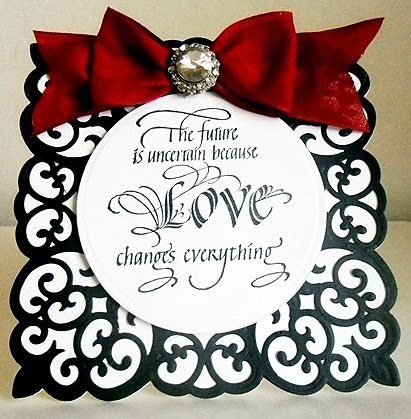 Using Spellbinders standard Circles, die cut a black circle and a striped circle. Adhere together and machine stitch. Adhere to card front. 3. Cover polaroid frame with patterned paper and trim. 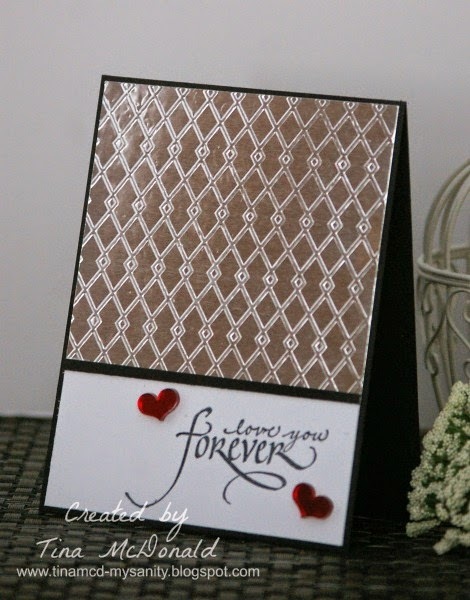 Stamp XOXO using Versamark ink, sprinkle with black embossing powder and heat set. Adhere to card front using foam tape. 4. Diecut Spellbinders scalloped hearts and SHOOT! arrow. Adhere. 5. Finish off with small black sequins. For my final project for today, I have created a horizontal design. I kept with a similar colour palate but changed up my design. 1. 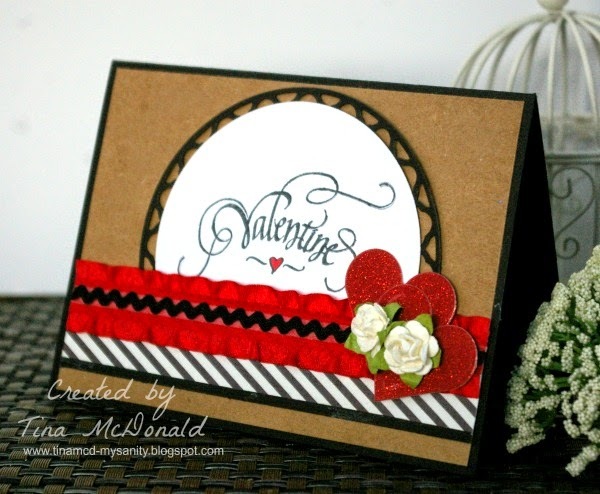 Create card base from black card stock. Trim Kraft card stock slightly smaller and adhere. Adhere strip of black striped paper, black card stock and red ruffled ribbon across bottom. Add rikrak. 2. 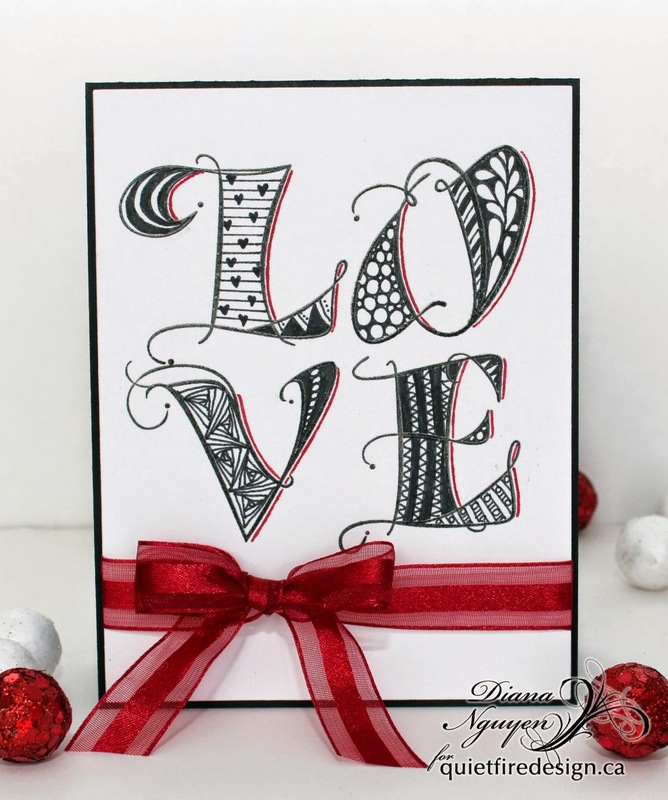 Stamp VALENTINE using black ink onto white card stock. Diecut using Spellbinders Standard Circles. Also die cut from black card stock Splendid Circles die. Adhere together, trim bottom and adhere just under red ribbon. 3. Cut/emboss Classic Hearts dies from red glitter paper. Adhere, add flowers. 4. 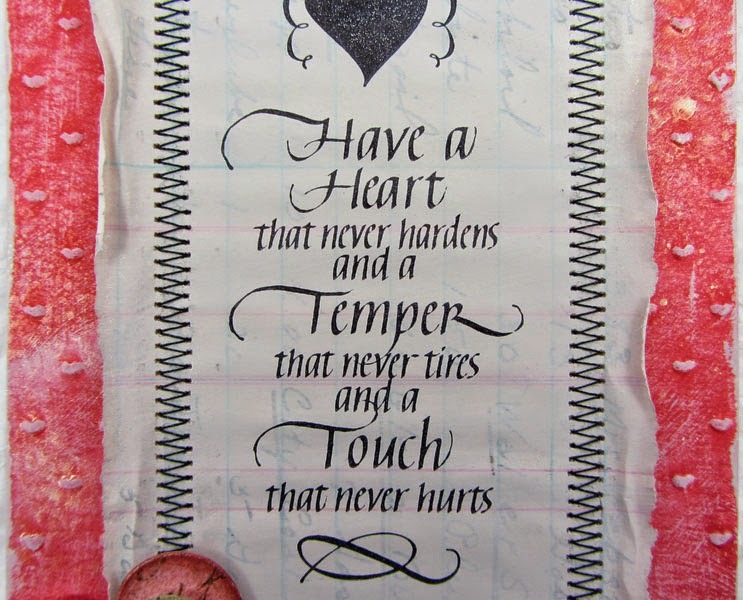 Use red marker to colour in heart on stamped sentiment. I had SO much fun creating these projects for todays post!! I am looking forward to sharing again with you later in the month!! 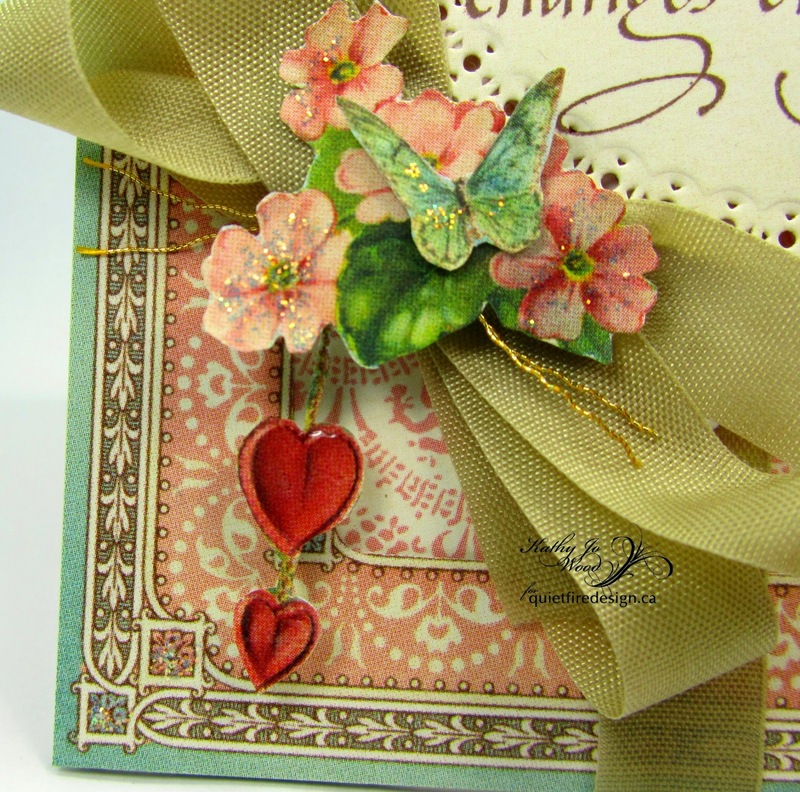 Special thanks to Suzanne for this opportunity to use her GORGEOUS stamps!! 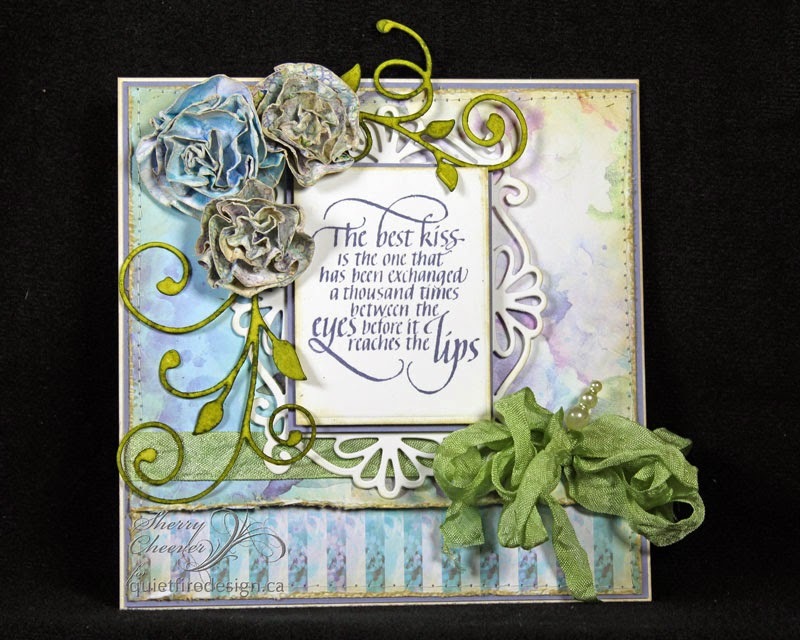 Sherry here today and I have a card to share using the new Quietfire Design stamp, The Best Kiss! 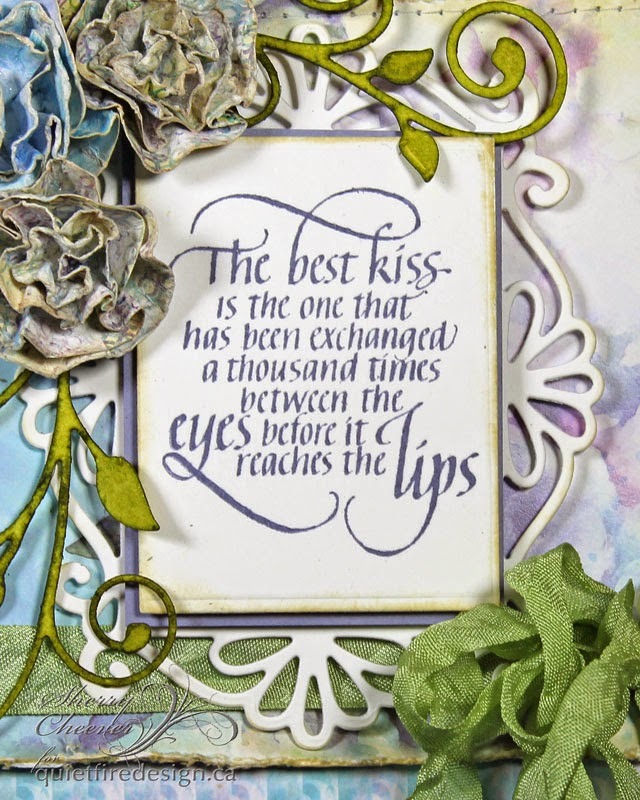 The sentiment was stamped in hydrangea ink (to match the paper) and die cut with a rectangle die template. 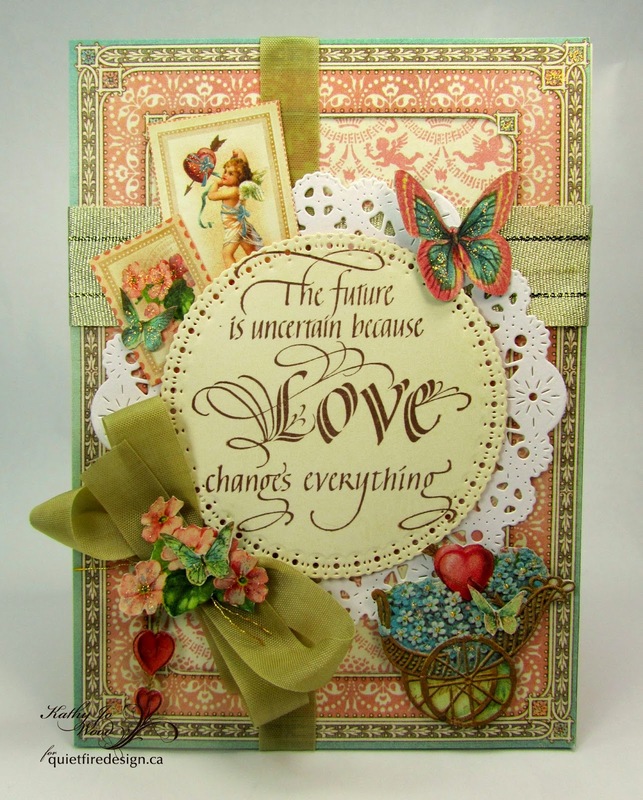 Coordinating paper was used for the layer behind the sentiment and the background layer for the designer paper. 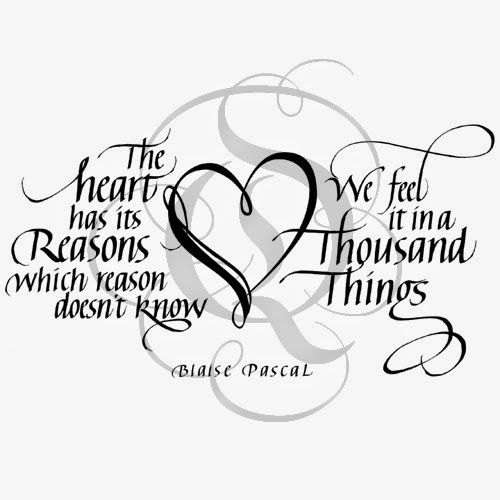 The base for the sentiment was die cut/embossed from a frame die template. The flowers were die cut with different sizes of circles that were then misted with water, scrunched up and layered.